Based around the less successful and generally disliked 924, the Porsche 944 turned out to be a hit for the German outfit. 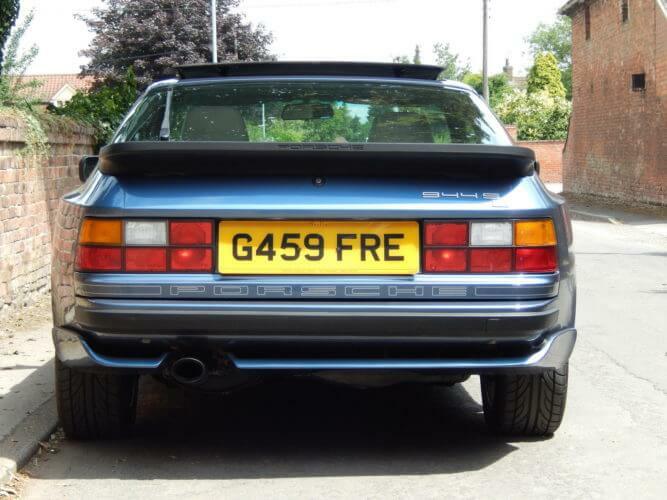 Launched in 1982, it looked like a beefed up 924 but delivered so much more than its predecessor. Its front mounted 2.5ltr four cylinder engine was derived from the 928 V8 and initially produced 150BHP. 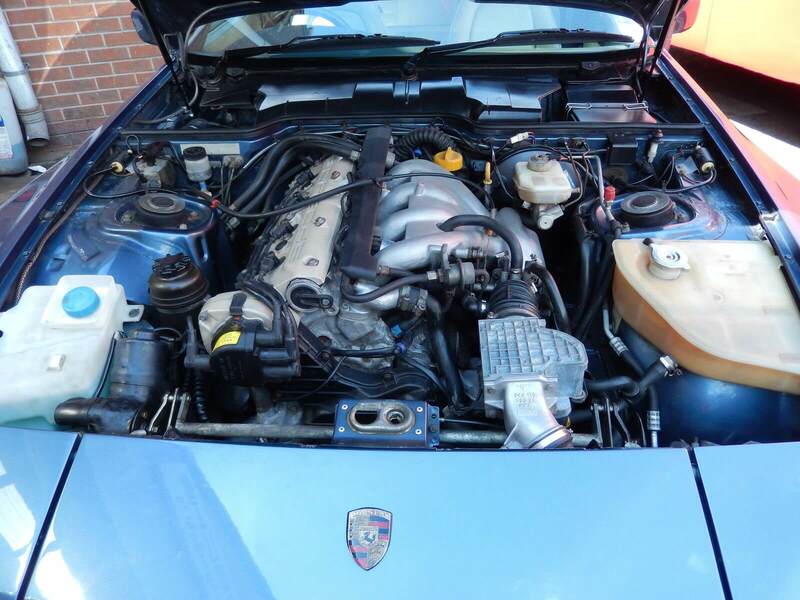 Handling proved to be excellent and the 944s engine had lots of torque providing good performance for a four cylinder engine. Power was of course sent to the rear wheels via a five speed or three speed automatic transmission. In 1989 the Porsche 944 S2 arrived on the scene. The engine was enlarged to 3.0ltr increasing output to an impressive 212BHP. The new aluminum block was lighter which helped improve performance even further. The updated S2 received a new front end and the braking system from the 944 Turbo S which had launched in 1988. These improvements made it an attractive compromise over the raw power of the 944 Turbo. When production came to an end in 1991, over 160,000 Porsche 944 models had been produced, making it one of Porsche’s most successful models ever. 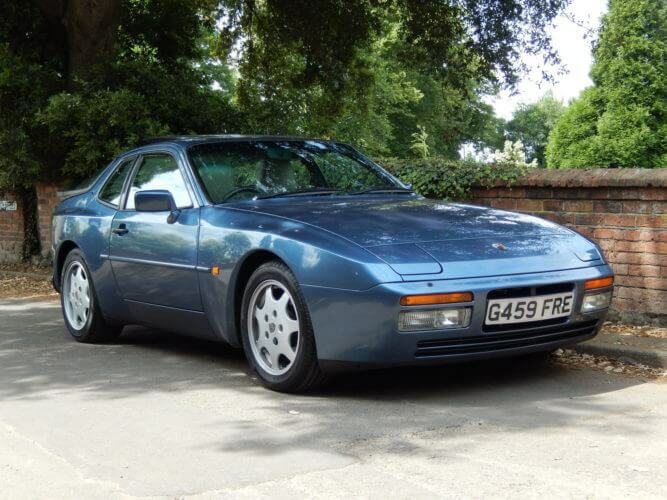 The Porsche 944 S2 on offer is a 1989 metallic blue manual with just 46,000 miles from new. 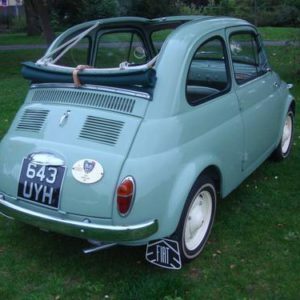 It is said to drive like new and has a good service history with MOT certificates to backup the current mileage. From the details listed it looks like the important service items like the belts (which should be replaced every 28,000 miles), have been taken care of which is important on a 944 S2. The bodywork is described as being in excellent condition with some paint corrections for stone chips. The underside is wax oiled as well. Inside it has the popular oval dashboard and a cream leather interior with air conditioning and is described as being all original. The seller notes that the spare wheel, tools, jack and compressor are present and untouched. 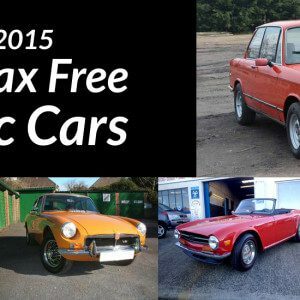 The car will also be sold with a full service and MOT. 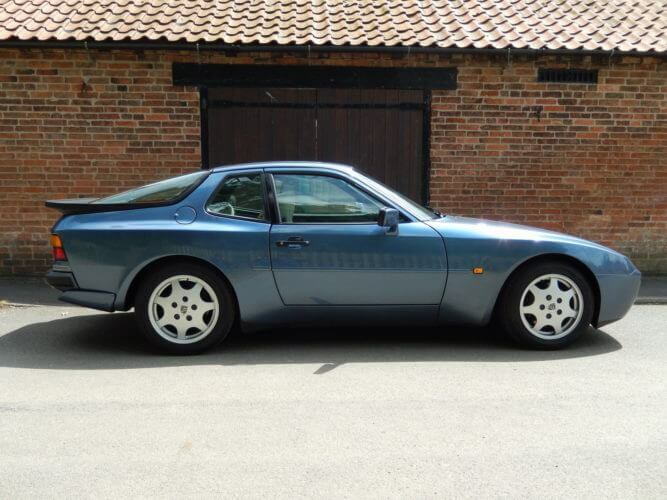 This 944 S2 wears a very nice shade of blue. While it looks a little like the 924 from the side, it looks much meaner. We like the stance of the rear especially the wide tyres. The 3.0ltr engine looks nice and clean. The interior looks a nice place to be. Barely 1800 miles a year. 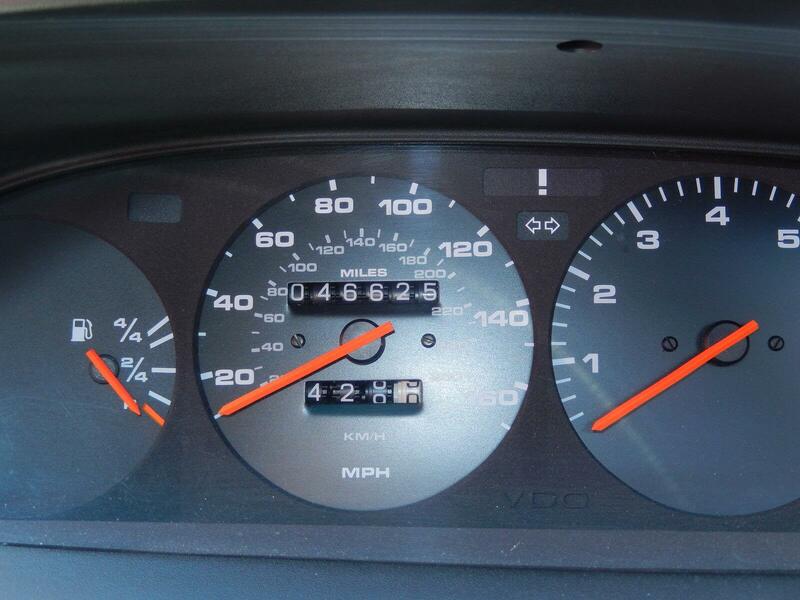 That is low mileage for a 1989 Porsche! 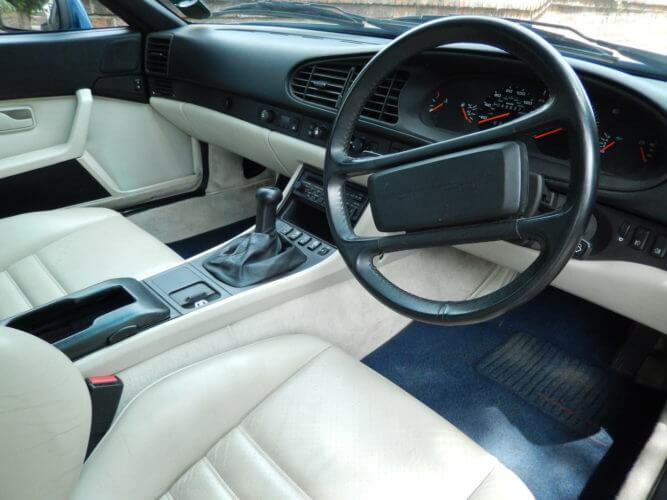 This Porsche 944 S2 looks really nice with its metallic blue paint and light cream leather interior. The bodywork looks great for a twenty five year old car and it has clearly been looked after. The alloys look perfect and are a style that suit the 944. The oval dash, a favorite of ours, looks in good shape and there is no mention of any warping or cracking. The half electric and heated sports seats look like they have some cracking to the leather on the drivers lower bolster and a few marks visible on the passengers side. Light coloured leather is hard to keep unmarked so a careful clean and some localised repairs should fix that. The engine bay looks nice and clean as well. Overall this is a very well looked after S2. With so many 944 S2s available for around £5,000, this 1989 Porsche 944 S2 might look expensive at £11,995. However it is hard to find a manual S2 in such good unmolested condition as this with very low mileage and with a thorough and extensive service history. And while it is not a 944 Turbo, it still has plenty of performance to offer and will be a less hairy drive than its more powerful sibling. These 944s make for good GT cruisers with bags of torque and having a sunroof along with air conditioning is a nice combination. With prices of the Porsche 944 on the rise, we’d snap this S2 up quickly before it is gone. This Porsche 944 S2 is located in Nottingham. The asking price is £11,995 which is open to offers.